COLOGNE, Germany — The United States defeated Slovakia 6-1 Sunday to book its place in the quarterfinals at the ice hockey world championship ahead of its Group A showdown with Russia. Johnny Gaudreau finished with two goals to take his tournament tally to six, and an assist, while Jimmy Howard made 19 saves on his fourth start for the Americans, whose confidence seems to be growing as they stretched their winning run to five games. Still, U.S. head coach Jeff Blashill saw room for improvement before the final group game against Russia on Tuesday. “One thing we have to clean up is puck management and turning pucks over,” Blashill said. Kevin Hayes and Brady Skjei played their first game on joining the side following the New York Rangers’ elimination from the NHL playoffs. Hayes, who was named player of the game, picked up two assists and Skjei had one. Clayton Keller, the youngest player at the tournament, opened the scoring, assisted by Anders Lee and Skjei. It was the 18-year-old Keller’s fifth goal of the championship. Gaudreau followed suit early in the second period, set up by Hayes before Martin Gernat pulled one back. Two quick-fire goals from Christian Dvorak, assisted by Gaudreau, and Jacob Trouba put the U.S. in a comfortable position. Gaudreau grabbed his second of the game to start the third period – Hayes again with the assist – before Lee scored on a power play. The U.S. moved top of Group A, one point ahead of Russia, which has a game in hand. The Russians, who also safely progressed to the quarterfinals, face Latvia on Monday, when the U.S. is idle. Sweden, which was boosted by the arrival of centre Nicklas Backstrom and goaltender Henrik Lundqvist, booked its quarterfinal place later Sunday with a 4-2 win over Scandinavian rival Denmark. An early goal from Joel Lundqvist followed by two from William Nylander put the Swedes in a commanding position before Morten Madsen and Markus Lauridsen pulled Denmark back in the third period. Backstrom sealed the win on a power play as Sweden ensured it cannot finish any lower than fourth in Group A. The top four in each group go through to the quarterfinals. 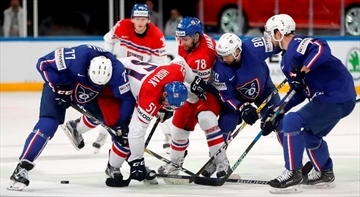 The Czech Republic ended France’s hopes of making the quarterfinals from Group B with a 5-2 victory in Paris. The tournament co-hosts failed to make the most of two 5-on-3 chances and more power play time, 10:35 compared to just 2:43 for the Czechs. Finland came from two goals down to beat the Swiss 3-2 in overtime in Group B.
Fabrice Herzog and Joel Genazzi put Switzerland two goals up before Juuso Hietanen pulled one back on a power play before the end of the first interval and Mikko Rantanen equalized in the third to send the game to overtime. Valtteri Filppula scored the winner as Finland consolidated fourth place in the group.